It is increasingly recognized that most mental disorders have their neurodevelopmental origins. Therefore, early identification of risk and subsequent timely intervention represents the most promising strategy to rectify abnormal growth trajectories with the final goal to prevent future disease onset or, at least, reduce symptom severity. As a result, better understanding of the mechanisms underlying early brain development represents an urgent endeavor to improve clinical practice. Particularly, neuroimaging based study holds great potential to develop effective biomarkers for early identification of risk. In this talk, I will highlight some of our combined imaging-behavior studies aiming for better understanding of both normal brain development mechanisms and abnormal growth trajectories due to genetic and/or environmental risks. The foremost important tool we use is the resting-state functional connectivity technique but studies using diffusion tensor imaging (DTI) will also be briefly touched upon. Dr. Gao is a Tenure-track Assistant Professor at the Department of Radiology and Biomedical Research Imaging Center in University of North Carolina at Chapel Hill. 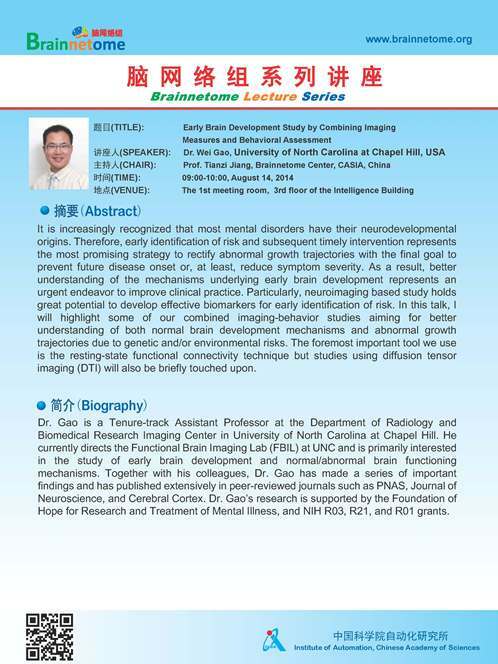 He currently directs the Functional Brain Imaging Lab (FBIL) at UNC and is primarily interested in the study of early brain development and normal/abnormal brain functioning mechanisms. Together with his colleagues, Dr. Gao has made a series of important findings and has published extensively in peer-reviewed journals such as PNAS, Journal of Neuroscience, and Cerebral Cortex. Dr. Gao's research is supported by the Foundation of Hope for Research and Treatment of Mental Illness, and NIH R03, R21, and R01 grants.